It’s been a minute since we’ve done an actual blog post, but there’s nothing like a polar vortex to get you to sit down and reflect, so here we go! Marissa is taking over as Executive Director, and we’re beyond lucky to welcome back Cheryl to our Market Manager position! I couldn’t ask for a better transition team to help me— you know, give away my baby. It’s totally going to be fine, right? While we’re on the subject of my legacy at Crafty Mart, I’d like to share with you a few things I’m proud of. In 2018, Crafty Mart gave $3250 in cash directly to artists. Besides the Jennifer Davis Award given to Kyle Josza, Crafty Mart established Creative Catapult, a meal-based crowd-funded microgrant program for makers. We awarded a $2,000 grant to Broke N Bored Concepts and a surprise $1,000 to Threadbare with the help of our friends at the eBay Foundation. With the funds established, we plan on giving away another $1,000 grant each year, and who knows? 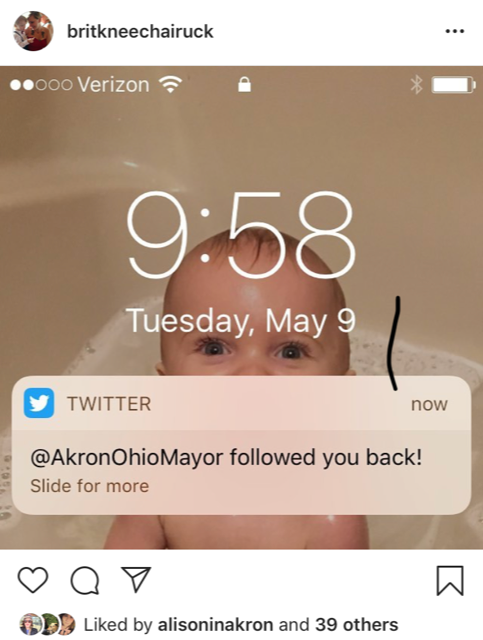 Maybe we’ll find some other sponsors who are enthusiastic about Akron’s thriving creative culture that will pitch in so that we can give out more surprise awards! And of course, exposure. But we all know you can’t pay your bills in exposure. In 2019, Crafty Mart is providing space for artists to offer workshops to the public to promote their businesses and (of course!) make money. Our space is ready for DIY workshops! If you're a Maker and have an idea for a workshop, contact marissa@craftymart.org! Crafty Mart grew their wings at their 10x10 feet office space at Summit Artspace which we had for years and left the nest to spread out at Bounce Innovation Hub. In this larger space, we can host our staff meetings, board meetings, and are stoked to open it up the public for artist workshops! The next one coming up is an Intro to Embroidery Class with Bethany Wells. It’s on my calendar, and I hope to see you there. Crafty Mart is not your typical Arts Organization. Coming from super DIY roots, Crafty Mart has been on a journey to find their way among the landscape of the formal nonprofit arts world since we got our 501(c)3 in 2015. We tried following suit with the status quo and hosting fancy galas to raise funds to leverage foundation dollars, but we came up short. Our people don’t want to throw their hard earned dollars at fancy galas— they want to have a good time, and they want their money to go directly to artists, not to organizations or corporations. I hope you’ll join us for our 2019 signature fundraising event: Creative Catapult, where you can enjoy a modest meal in a handmade bowl that you get to take home and vote for your favorite maker who gets to take home most of our money. All the proceeds beyond that will fund the 2020 Creative Catapult grant. There is no way I could have accomplished all I did in my tenor at Crafty Mart if I was any other place than Akron. The City, the County, and the Community has gone out of their way to let us know that THE ARTS ARE VALUED, and I personally have connected with an entire community (my “friendors”— credit: Brandi) that I cannot imagine my life without. I know that Crafty Mart will continue to host cool events and provide great entrepreneurial education to creatives with the help of our amazing philanthropic community alongside everyday people. I’m currently working hard on Bechdel Fest, a film festival downtown Akron that draws attention to gender inequality in media that will take place May 29 - June of this year. I’m also working with my good friend Megan on Midwest Craft Con, returning in 2020. Dates and keynote speaker announcements are forthcoming! I’m sure we’ll see you all out and about at all the Arts events popping up in and around Akron, but in the meantime, thanks to everyone who has supported Crafty Mart over the years! We're excited to announce that we're adding another team member to organize our holiday markets. You may already recognize him from Crafty Mart's early days... Everyone, meet J! J is co-founder of Crafty Mart. He is director of the Hudson Farmer’s Market in Hudson, Ohio as well as the creator of the food festival Sausage Fest, and the Akron Farm and Flea. He has four children age 3-34 and one grandchild. J likes to read, write, hike and collect records in his spare time, but let's be honest, he doesn’t have any spare time. We are beyond excited to be working with J again! Ever wondered about the rest of the people behind Crafty Mart? Revisit the rest of our Team Profiles here! Our friendors at Expedition SubSahara are guestagramming on our instagram today and tomorrow! Check us out @craftymart, and their website of great products. Or, you could just swing by our 2018 Mom & Pop Shoppe this Saturday at The Akron Art Museum! "Hi! I'm Sofi, the founder of Expedition Subsahara, a social connection that began as a tiny seed — a dream — and that we’re working to grow into something beautiful. Originally from Senegal, West Africa, I came to the United States because my mom wanted me to have a bright future. She thought the best chance for me to thrive was for me to get a quality education. While there are schools in Senegal, there are a lot of gaps in education and it’s not always a priority for young girls to attend or finish school. The average household in Senegal makes $100 a month and for a lot of families, there’s simply no extra money to send their children to school. When I first came to America, I realized that Africans have a misconception of what America is like: think big houses, fancy cars and lots of cash. I basically thought America was Hollywood. And now that I’ve lived here half of my life, I know that Americans also have a misconception of what Africa is like. Though Africa is a continent of diverse countries, sometimes they get lumped in the same stereotype. People have asked if I lived in a hut, had a lion as a pet, or if there are streets where I grew up (no, no, although that would be cool, and yes). I’m privileged to understand these cultural misunderstandings. Neither Americans perceptions of Africa nor Africans perception of America are truths, but there are hints of truth in each. There are advantages to America, just as there are advantages to living in Africa. My mom knew my educational advantage would be here. An American degree means something to the rest of the world. I understand now that if you take a single stereotype and make it THE story for an entire people, you’re doing a disservice to the world. It creates conflict when instead of investing in understanding one another’s stories, we focus only on the story we know. It makes it hard to empathize with other cultures and people. Every culture is made out of a million stories. Each country’s story is complex. It is our goal at Expedition Subsahara to create a space where we can connect cultures in a way that’s respectful to all. We want to expand dialog to increase understanding and empathy. Connecting cultures starts with being introduced to them. Our products are made by African artisans. No matter where you display or wear them, you’re helping start a conversation and hopefully, create a more empathetic and understanding world. ...And if all of that’s not enough, we plan on using the proceeds to build a school in Senegal. The school will benefit women like those who make our products, so that they have viable, technological knowledge to use in the modern workforce. We created Expedition Subsahara as a bridge that extends to everyone so that maybe someday our similarities matter more than our differences. And because girls education should be on an equal platform across the globe. " Get the Most Out of Your Trip to the Mom & Pop Shoppe! We are so pumped about our annual spring show coming up this Saturday, April 21st! This year, The Mom & Pop Shoppe is timed perfectly-- it's just in time Mother's Day, graduation party season, and Father's Day too! We put together a little guide for you to get the most out of your day. This year, we are offering early bird access tickets. For a $7 ticket, you can beat the crowd. You’re also guaranteed a hand screenprinted canvas (thanks Champaign Paper!) shopping bag and a free drink! Choose from coffee, Tea Dude tea, a mimosa or water. You can purchase tickets here, and there will be a limited amount available at the door for $10, but you're only guaranteed a swag bag if you get there early. Don't stress about heading downtown. There's plenty of parking and it's free on the weekends! We recommend the Library lot or the lot between Summit Artspace and the Akron Art Museum! Have you been following our vendor profiles and Instagram takeovers?! The curation process was highly competitive, and we're so excited to show off such amazing talent. Urban Eats and Western Fruit Basket are both within walking distance, and the Akron Art Museum's cafe has amazing soups, wraps, and a great selection of beer and wine. Sweet Mary's Bakery and Akron Coffee Roasters are both open for your breakfast needs, too! The Akron Art Museum Galleries are open throughout the event! Check out their latest exhibitions. Summit Artspace's gallery is also open featuring a beautiful photography exhibit highlighting all 24 neighborhoods in Akron. Why not spend the whole day enjoying our beautiful downtown? Take a visit to the Akron Children's Museum or the Akron Zoo, or make plans for dinner at one of our amazing downtown restaurants like Nuevo, Crave, Bricco or the Lockview. The Nightlight Cinema has several showings of Wes Anderson's Isle of Dogs throughout the day, or you could head down to The Bomb Shelter to keep on shopping! Our friends from Whiskertin Lighting, who are vending all day, are hosting an unofficial afterparty at Musica featuring their band Worship This! The show starts at 8pm. Who says there's nothing cool to do in Akron?! For more exciting stuff, check out SummitLive365's website where you can search events by date or category. See you Saturday! Early bird entry starts at 10, and the show is free to the public from 11am - 5pm. Our pals at Tidal Cool were just in Africa for a fashion show that featured their work! You can check out some photos on our instagram as they take over, but also at our fast-approaching 2018 Mom and Pop Shoppe on April 21 at The Akron Art Museum. Tidal Cool is a fashion experience pulling global inspiration from prints, patterns, and techniques to create clothing, jewelry, and henna body art. Fashion artist Andrea Howell, the American designer/maker behind the label, uses fine tailoring and attention to detail to create bold, timeless garments. The newest Tidal Cool collection is inspired by global fashion, and marries African inspiration with American design, and includes traditional Ghanaian fabrics like Kente cloth and wax block cottons, as well as Malian mud cloths. The Tidal Cool Boutique is located in Cleveland, Ohio.